Video Game Firsts: 3D Monster Maze | Warped Factor - Words in the Key of Geek. Released in 1982 on the Sinclair ZX81, 3D Monster Maze was the first game incorporating typical elements of the genre that would later be termed survival horror. It is also widely acknowledged as first 3D game for a home computer. 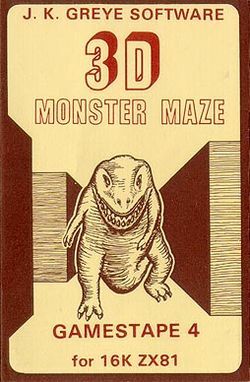 Developed by Malcolm Evans in 1981, after his wife bought him a Sinclair ZX81 for his birthday, 3D Monster Maze puts the player in a maze with one exit and a hostile monster, a Tyrannosaurus Rex. There, the player must traverse a 16 by 18 randomly generated maze, rendered from the first-person perspective, and escape through the exit without being eaten. The game awarded points for each step the player took without getting caught by the Tyrannosaurus Rex. A status update on the screen gave you hints as to where the Tyrannosaurus Rex was, featuring messages such as REX LIES IN WAIT, REX HAS SEEN YOU, and RUN HE IS BEHIND YOU. Once you exit the first maze you head straight into the next, sentenced to roam the corridors forever! "3D Monster Maze is the best game I have seen for the Sinclair ZX81." After it's release and subsequent success Malcolm Evans made a decision to concentrate fully on computer gaming, founding the company New Generation Software. After releasing 3D Defender and Breakout for the ZX81, Malcolm switched development efforts to the ZX Spectrum and released many classic Speccy titles including Escape, 3D Tunnel, Knot in 3D, Corridors of Genon, and Trashman.